Hobart's #1 tour on Tripadvisor! 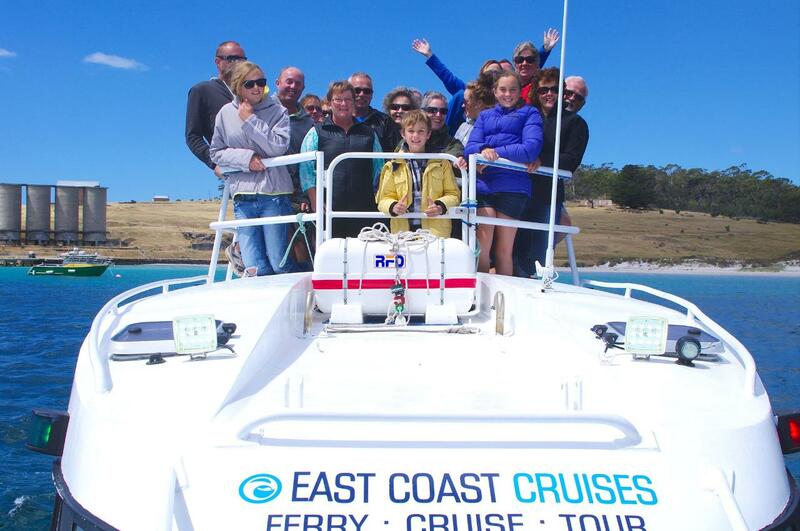 Join us on the most unforgettable day tour, cruising the renowned coastline of Maria Island and Tasmania's stunning East Coast. Our shuttle bus will pick you up from your hotel in Hobart and drive you to our departure location at Triabunna. If you have your own transport, simply meet us at Triabunna and let us take you on the adventure of a lifetime. Your tour will depart from the Triabunna marina (approximately 1-hour and 15-minutes from Hobart), and includes a 4-hour scenic cruise of Maria Island's stunning coastline with a 2-hour stay on the island including a gentle walk of Maria's World Heritage listed convict settlement. A big buffet lunch of gourmet Tasmanian food, cheeses, juice, tea and coffee is provided complimentary on board. Local wines (Darlington Pinot Noir, Chardonnay, Riesling, Sauvignon Blanc) and Tasmanian premium larger are also provided for purchase during lunch. Choose from two alternate tours! One Day On Maria (Ile Des Phoques) and One Day On Maria (Circumnavigation) are offered on alternate days. Please see our website for the dates of each tour. 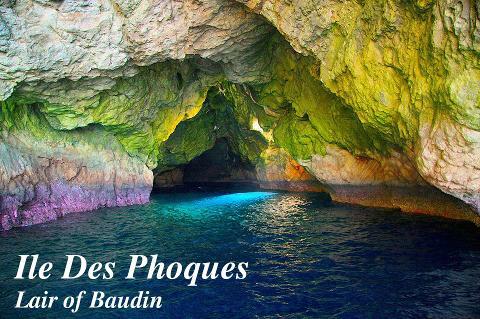 The Ile Des Phoques has been our favourite place to cruise, swim, dive and explore ever since we began in 2007. 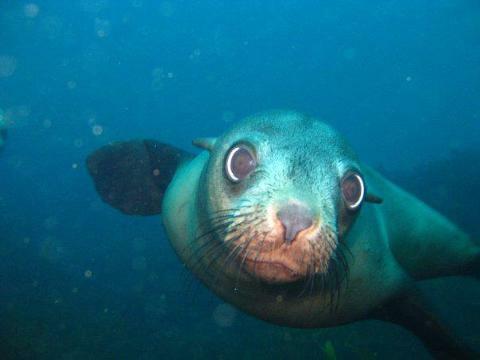 The Ile Des Phoques (French for Island of Seals) is an absolute haven for marine life and has been declared one of the best cold water dives in the world. Your cruise to the seals will capture the stunning views of Maria Island, including famous landmarks such as the Painted Cliffs and Fossil Cliffs, spring-fed waterfalls, limestone sea caves, cliff-top stalactites, Bishop & Clerk mountain range and the stunning granite cliffs of Maria Island's east coast. At the northern tip of Maria Island the cruise will head North to the Ile Des Phoques, a 30min boat ride from Maria Island. On the way to this remarkable granite island you can see albatross, dolphins, Australian fur seals and whales (depending on the time of year) as well as majestic panoramic views of Maria Island and the Freycinet Peninsula. *Note, if poor weather prevents the cruising to the Ile Des Phoques, the cruise will be changed to circumnavigate Maria Island. If you have chosen the circumnavigation, your cruise around the Island is a totally immersive and different experience. The east coast of Maria Island showcases mountain fed waterfalls, secluded bays, sea caves, ancient geology and beaches of pure white sand. 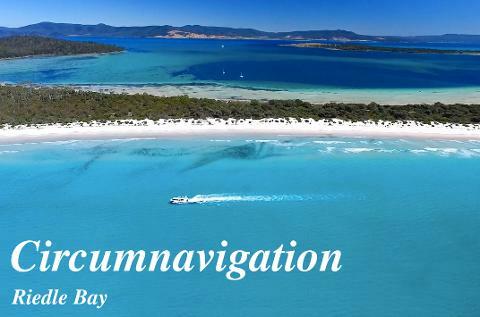 Enjoy expert commentary as you cruise to the renowned Riedle Bay and Shoal Bay at Maria Island's isthmus for a gourmet lunch on anchor. These stunning beaches are both identical to the world-famous Wineglass Bay and are only visited by a handful of people each year. En route around Maria Island we stop to showcase many famous landmarks including the Fossil Cliffs and Painted Cliffs. Your big buffet lunch provided on board each cruise includes Tasmanian smoked salmon, ham, chicken, roast beef, home made potato salad, freshly prepared salad, Tasmanian soft and hard cheeses, avocado dips, crackers, wraps and rolls. You will also provided a complimentary drink or tea, coffee, juice and water. Local wines (Pinot Noir, Chardonnay, Riesling, Sauvignon Blanc) and Tasmanian premium larger are also available for purchase during lunch. In the afternoon, both tours will dock at Darlington. The perfect way to compliment your cruise is to stretch your legs and enjoy a guided tour through Darlington’s fascinating collection of preserved convict buildings, learn about the town’s remarkable history and come face to face with Maria Island’s resident wombats. If history is not for you, then simply soak up the sun on Darlington’s white sandy beach or swim/snorkel in the waters of Maria Island’s marine reserve. 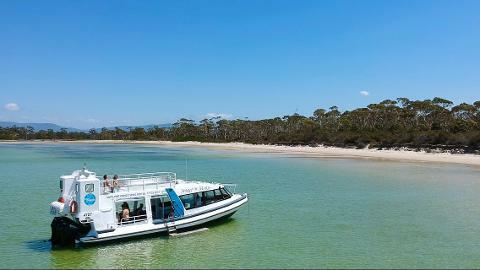 Tour departs Triabunna at 9:15am and returns at 4:45pm - 5:00pm.